I saw this most amazing thing on Facebook today, via Etsy. 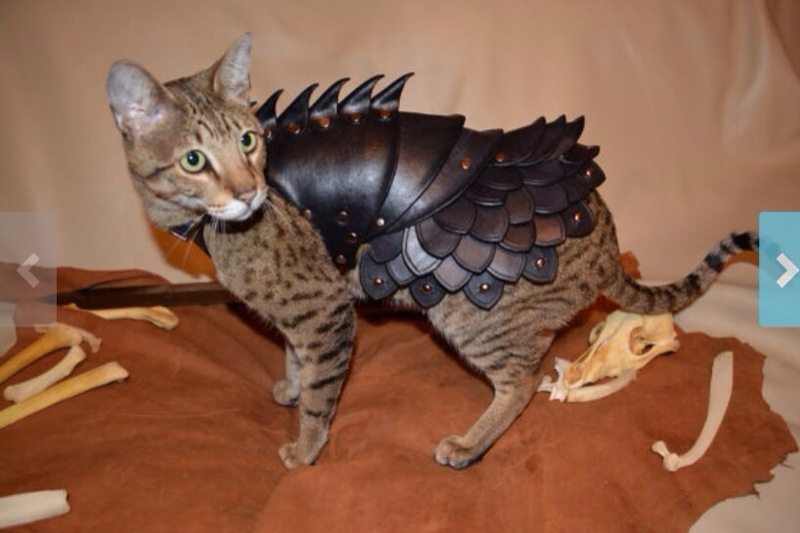 Cat Battle-Armor. Can you just imagine the number of photos I would put up? Anyone want to give me €395 just to see the pictures I’d share? I managed to steal a screen shot photo. I loooove this! Even better that the model looks like a Bengal. It’s a proper harness. I would walk Spot everywhere if this was mine. Yes! With more spines, and a leash instead of a saddle! Just what you need. Maybe you could sew one up. Not a chance! I probably couldn’t even make a tinfoil hat. Then you are as creative and crafty as me. I can do some stuff – but sewing, knitting and crochet stymie me. So frustrating. Heh, I bet you and your h!usband could make a personalized one, would be even better than a bought one, AND you could make matching ones for the dogs. Get even wilder and crazier and make them for yourselves that match!!! !whoo hoo, now that would be a sight! Ahh the imagination runeth over. That’s great attire for a cat. Watch out dogs! He already thinks he’s bigger and badder than a dog. I’d be feeding his kitty-ego for sure! He’d probably turn green with disgust if I put this on him! Not really, he adores his harness we have now, so he would be happy as hell to wear this if it meant getting to go outside. Braggart 🙂 it was 1 here yesterday. Next post is the pretty frost photos I took! He would love it! Anything that gets him walkies makes him happy. Do they do a dog version??? I want! Ah! I like it!! It’s quite expensive though!! If I wasn’t drowning all my money into fish tanks, I’d sure give it to you. When’s your birthday already? Not until August – I’m sure someone will have bought it by then! Oh! It’s a unique item! I thought it was generally available. That explains the price then. Ah well! Yep, handmade, one of a kind! I need an advertiser to buy it for us so they can be in all the pics.